The Fire and Ice finally came together in the third episode of season seven of 'Game of Thrones'. 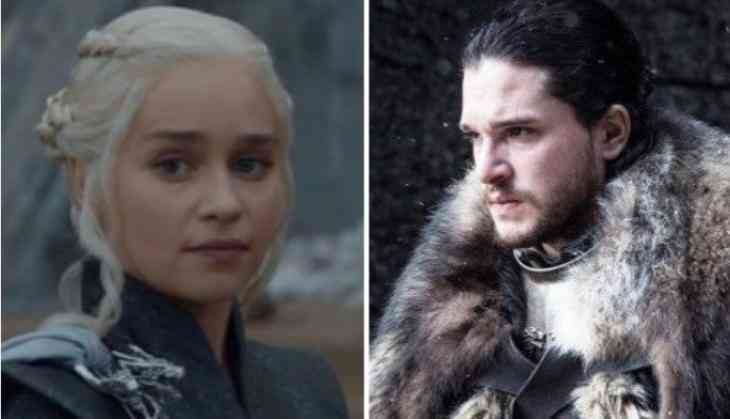 In the scene, Danaerys demanded Jon declare House Stark's allegiance to her Targaryen claim for the Iron Throne while Jon begged for her assistance to help him fight the Army of the Dead, something she doesn't believe even exists. Eventually, they struck an uneasy agreement, yet it's unclear where they go from here. According to the Entertainment Weekly, both the actors, Harington and Clarke had an idea that their characters are going to be meeting this season but did not think that it will be so quickly. Harington, who portrays the role of Jon Snow, said, "I predicted, like everyone, they would meet this season, but I don't think I predicted it quite as quickly. But then again, you've got to take yourself out of the mindset of the viewer. As far as Jon knows, he's just meeting this queen he's heard of and trying to negotiate with her - he's not meeting Daenerys, who the audience has been watching for so many years." "That helps with the surprise of it. He walks into the room and doesn't expect to see such a beautiful young woman of similar age to him. Any young man's reaction is going to be, 'Okay.' but he puts that aside because he has to," he added. Meanwhile, Clarke summed up the meeting a little differently. She shared, "I had an idea it was coming this season, sure. It was fun to play - she doesn't like him and she doesn't believe him. It's a meeting that showrunners David Benioff and Dan Weiss had been excited to unveil for years. "It was really fun to watch that scene and I thought they did a great job. There isn't instant chemistry. He's annoying and she's annoying and they have to figure out how to make peace," noted Benioff.